Notes: Moderately (severely) cost burdened households spend 30–50 percent (more than 50 percent) of income on housing costs. 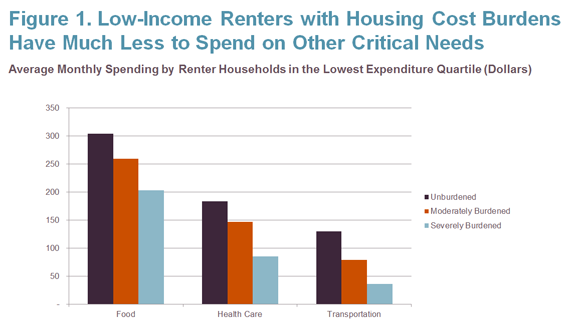 Lowest spending quartile is a proxy for low-income households. Source: JCHS tabulations of the US Bureau of Labor Statistics, 2013 Consumer Expenditure Survey. We’re already seeing a growth in the older low-income population. The number of households aged 62 and over earning less than 50 percent of area median income (a common eligibility threshold for rental assistance programs for the “elderly”) increased by 21 percent from 2003 to 2013 to almost 4 million. At latest estimate in 2011, only about a third of this group benefits from rental assistance (HUD, 2013). 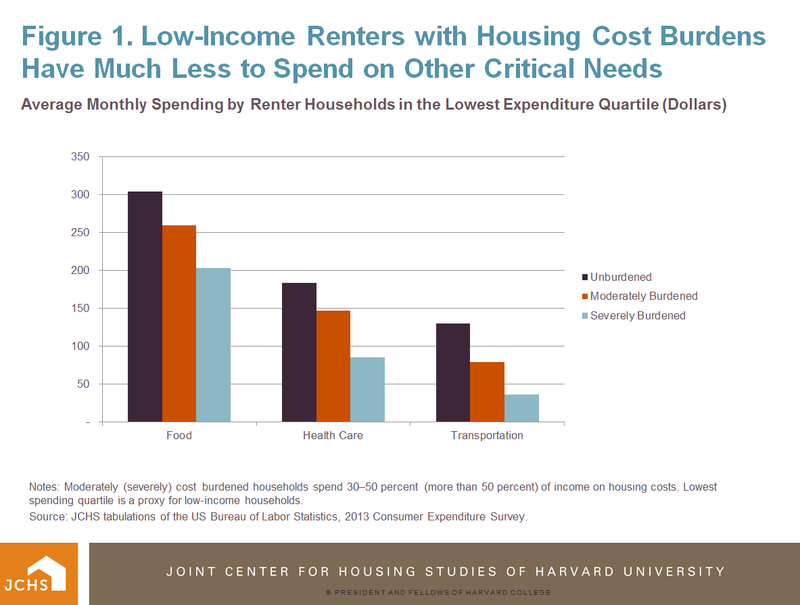 Of those who do not, a substantial number face worst case housing needs – defined as living in severely inadequate units, paying more than 50 percent of their income on housing (with the repercussions of reduced spending on other necessities mentioned above), or both. According to HUD, nearly 1.5 million very low income older households had worst case housing needs in 2013 – an increase of 31 percent from 2003 to 2013. Going forward, assuming income distributions remain similar to today, the expanding older population means millions more older renters will have very low incomes and potential housing affordability problems in the years ahead. 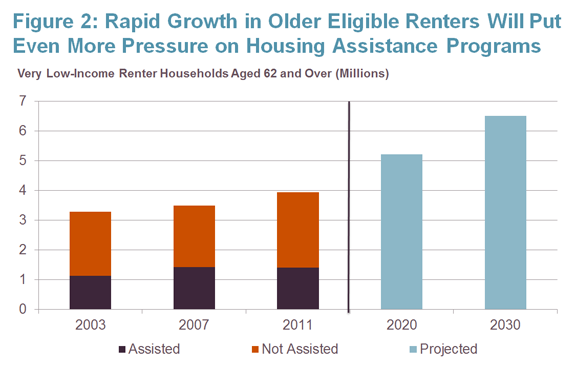 Just to keep the share receiving federal rental assistance at its current level, the number of older renters receiving assistance would have to rise by 900,000 by 2030 – which would still leave 3-4 million income-eligible renters without assistance and on their own to find housing in the private market (Figure 2), vulnerable to worst case housing needs. On top of these concerns, even as the need for assisted housing is growing, contracts for hundreds of thousands of units of units with project-based rental assistance are set to expire over the next decade. Sources: JCHS tabulations of US Department of Housing and Urban Development, Worst Case Needs Reports to Congress 2011, and JCHS 2013 Household Projections. These estimates are based on current income distributions, yet current trends may reshape the income profile of older adults in the future. Fewer of today’s workers earn pensions that have traditionally provided support for moderate-income retirees. According to the Bureau of Labor Statistics, 35 percent of all private industry workers were covered by pensions in the early 1990s, a rate that stood at only 18 percent in 2011. Increasing numbers of American have 401(k) plans but these have not resulted in the same savings achieved through pension benefits. Meanwhile, real incomes have been falling for those in their pre-retirement years, while housing and non-housing debt have been increasing for those 50-64, likely reducing assets that can be drawn upon later in life. In addition, the older population of the future will be more racially and ethnically diverse, reflecting shifts in the population as a whole; this may shift the income distribution for older adults downward, as African Americans and Hispanics have historically had lower incomes (as well as homeownership rates). With rapid population growth and worrisome trends in income, debt, and savings, preserving and creating more affordable units and ensuring sufficient subsidy to meet the needs of older low-income renters requires action at all levels. At the local level, communities can encourage the production of market-rate but lower cost housing options, including accessory dwelling units, rental housing in town centers, and apartments located near safe and accessible transit (particularly important because low-income renters are less likely to own cars). Though changing local regulations to allow such development and overcoming NIMBY opposition to rental housing pose challenges, increasing affordable housing options is important not just to older adults who wish to age in their communities, but also to cost-burdened rental households of all ages and composition. 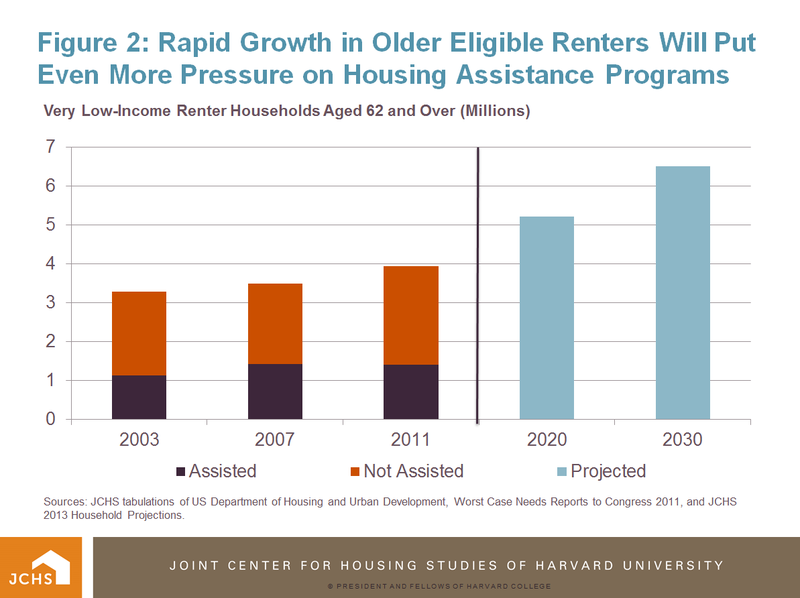 Securing the resources that will help preserve and build new assisted units and ensure the availability of rental subsidies for those at the bottom of the income scale is undoubtedly an immense challenge, particularly given that pressures on non-discretionary portions of the federal budget (including Medicare, Medicaid, and Social Security) are also growing as the population ages. Yet looking holistically at the role of affordable housing in older adults’ overall health may help make the case that safe, affordable housing creates savings to the federal budget through the healthcare system. HUD and HHS are now working together to study the benefits of coordinated health services and supportive, affordable housing in Support and Services at Home (SASH) program in Vermont; evidence from this and other studies may point to the fiscal wisdom of investing in affordable housing for older adults. Your evaluation is very accurate. I have been observing seniors for many years and working with affordable housing that has a focus on senior citizens and those with moderate disabilities. I have been harping on this this subject for several years; unfortunately I do not have a formal degree, and I live in rural Ohio. So, my comments were not seriously given consideration. However, I am on the ground and have been listening to people that are facing these problems for many years. We also have to realize that some of our younger folks aged approximately 45 to who knows, often need to help their children, grandchildren and/or their parents as well, do many factors including the current economic conditions and that can make for difficulties in their futures. I praise your report, and know that it took a lot of hard work. It often takes someone with a creditable research background, from a highly respected university to get people to listen, and I sincerely hope people will take your message to heart and start moving forward. One of the major problems is that we are not creating well planned livable communities that consider life in the long-term. The Tax Low Income Credit Housing Program does make a dint in our need for affordable housing. However we have a large number of people that fall through the cracks, they over qualify for the LIHTC program, but do not have the income that allows them to live in many of the long-term, well planned and designed healthy lifestyle communities. Currently most of these communities are being constructed for those with higher incomes. Many of the folks with more moderate incomes are struggling and falling through the cracks. They over qualify for the program but do not have the income that allows them to live in many of the long-term and designed healthy lifestyle communities that allow for a variety of incomes can offer opportunities that will keep these people from needing government assistance for a longer period of time. We need communities that allow for a variety of incomes that are designed to offer opportunities that will keep these people from needing government assistance for a longer period of time. [You would be surprised at the number of people that are out living their retirement incomes. As you stated due to current lack of retirement benefits, retirement incomes are declining.] Carefully designed multi-income communities can offer more opportunities for financial sustainability for residents and community owners, but, it seems to be a hard sell to our government, equity providers and developers. The very BEST to you and your work.